Two women were arrested Wednesday after allegedly stealing a large, but undisclosed amount of baby formula and hightailing it out of a Pacifica store. Police said officers were dispatched to a Safeway at 1380 Linda Mar Blvd. around 5 p.m. after a store employee reported the theft. The employee said two women climbed into a white Dodge Caravan and drove northbound on State Route 1. Upon noticing the car and conducting a traffic stop, officers identified the suspects as the pair accused of robbing the store. Officers said they also found evidence in the vehicle that connected the women to a theft ring operating throughout the Bay Area. The suspects — Akasia Palmore, 20, of Rodeo, and Zanae Jones, 21, of Antioch — have been arrested, police said. The duo has been booked into San Mateo County Jail on a litany of charges, including burglary, criminal conspiracy and providing a false name to a police officer. They also face a number of warrants for theft, filed by law enforcement agencies outside San Mateo County. 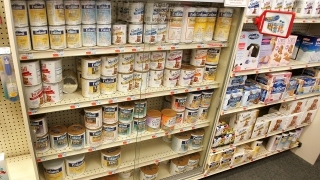 Although baby formula seems like a banal item, it is among the most commonly shoplifted items across the United States, Vocativ reports, noting that the black market for formula is booming as it used to concoct drugs, including cocaine and heroine.